It was a beautiful day at The Resort at Pelican Hill in Newport Beach as golfers arrived for the 9th Annual West Coast Classic. 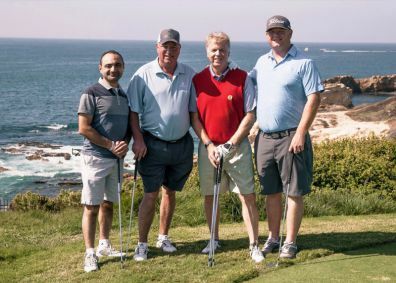 The financial services industry came together, led by Foundation Sponsors BNY Mellon, Eagle Investment Systems, and ICE Data Services, on both courses at Pelican Hill in support of Expect Miracles Foundation’s mission to invest in life-saving cancer research and advance patient care programs. As guests arrived, they enjoyed catching up with industry friends, while having breakfast, provided by Bagel Shack, on the stunning patio at Pelican Hill. After receiving tokens of appreciation from Tommy Bahama, golfers headed out onto the links, and were treated to 18 holes of jaw-dropping scenery so beautiful they had to remind themselves to keep their eye on the ball. When golf concluded, Frank Strauss, Founder and Chairman, and Frank Heavey, Executive Director, welcomed guests to the Post Golf Reception and thanked the guests for their financial support and participation in the 9th Annual West Coast Classic – noting that all attendees are impacting, caring for, and curing cancer patients by playing golf today. Heavey presented the Expect Miracles Award to Michael Collins from Broadridge Financial Solutions. The Expect Miracles Award is presented in memory of Steve Katzin, co-founder of the foundation, recognizing an individual who goes above and beyond to donate and raise significant funds for Expect Miracles Foundation and the fight against cancer. Congratulations Michael, we appreciate all your hard work. Heavey then announced that for the third year in a row, Expect Miracles Foundation will provide funding to The Simms/Mann – UCLA Center for Integrative Oncology at UCLA’s Jonsson Comprehensive Cancer Center. Through this program, parents are provided with developmentally appropriate ways to address the questions and concerns of their children and navigate the emotional impact of a cancer diagnosis and treatment. Lastly, Heavey thanked the Miracle Maker Leadership Council (MMLC) for all their support. This spring, the MMLC gave out 7 funding awards totaling over $53,000 to patient care programs nationwide. One of the recipients, Southern California-based From Maddi’s Closet, was present at the Post-Golf Reception to receive their check in person. Donna Holmes, the Founder and President of From Maddi’s Closet, gave a moving speech about the toll pediatric cancer takes on a family and the importance of having hope. From Maddi’s Closet is able to give children battling cancer love, hope and joy, assistance for families with special needs, public awareness, and support for pediatric cancer research. The MMLC proudly presented a check for $10,000 to From Maddi’s Closet. Thanks to actor and comedian Michael Anastasia, who served as emcee, the night got exciting during the Live Auction. Guests got into a bidding war over items such as a custom-made suit from Klein Epstein & Parker, and a private dinner party. After a memorable Live Auction, Expect Miracles Foundation received many overwhelmingly impactful donations. We are extremely grateful to everyone who made a donation. If you did not have an opportunity to donate and would like to do so, click here. To conclude the evening, the tournament results were announced and in a tight match, first, second and third place golfers were awarded prizes from Tommy Bahama PLUS golfers won airline miles, a trip to Aruba, and a stay in Las Vegas for the putting contest, opportunity drawing, and poker game! Expect Miracles Foundation is extremely grateful for the support of the golfers, sponsors, and hardworking volunteers who helped put on another remarkable West Coast Classic. It is with people like you, taking time out of your busy schedules for such an important cause, that together we inspire hope and ensure progress towards eradicating this horrible disease. YOU are the CURE!